This is one for those who love the sounds of nature with gentle ocean waves, bird song and evocative musical accompaniment to take you away from it all. The Seventh Wave evokes the ever-changing colours of the timeless and powerful ocean. Based upon recordings from the Atlantic coast of Southwest England and overlaid with inspired, improvised music, this album creates a gentle yet moving landscape of sound. 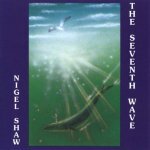 The Seventh Wave is comprised of two 24-minute pieces: LIGHT (featuring seagulls, bells, flute, strings and classical guitar) is clear, bright and uplifting. DEEP (featuring whale-song, pipes and synthesisers) is more hypnotic, creating images of the depths of the ocean. Total album duration 48 minutes.